Our very own AgentOrange called this speech-virus film "Canada's best new horror film" in his review and I'd have to agree. It's a great little film set in one location and reportedly, it's going to end up a trilogy! 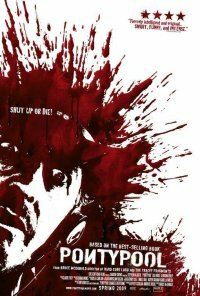 IFC will be giving Pontypool a limited theatrical release on May 29th. Shock jock Grant Mazzy has, once again, been kicked-off the Big City airwaves and now the only job he can get is the early morning show at CLSY Radio in the small town Pontypool which broadcasts from the basement of the small townâ€™s only church. What begins as another boring day of school bus cancellations, due to yet another massive snow storm, quickly turns deadly. Bizarre reports start piling in of people developing strange speech patterns and evoking horrendous acts of violence. But thereâ€™s nothing coming in on the news wires. Soâ€¦ is this really happening? Before long, Grant and the small staff at CLSY find themselves trapped in the radio station as they discover that this insane behavior taking over the town is being caused by a deadly virus being spread through the English language itself. Do they stay on the air in the hopes of being rescued or, are they in fact providing the virus with its ultimate leap over the airwaves and into the world? "Bizarre reports start piling in of people developing strange speech patterns and evoking horrendous acts of violence." Sounds just like Pontypool in Wales on an average weekend. Was that really new? It seems to be the same footage from the earlier teaser. your right rek, I fixed it. Let's support Canadian artists, not Canadian criminals.